Increasingly it seems there are reports of people are drawn to dunk themselves into extremely cold water. The Yenisei River, Siberia is the largest river system that flows into the Arctic Ocean. According to an article in The Guardian Weekend (Luhn 2016), Natalia Usacheva and her daughter Nastya swim in the river with the Megalopolis swimming club throughout the year. In winter they have to cut a hole in the ice with a chain saw to do this. Such people are known as ‘walruses’ in Russia. Natalia suggests that it is ‘an addiction’ a ‘necessity’ that ‘gives you a shot of energy and puts you in a good mood’. She also suggests it strengthens the immune system. With air temperatures reaching -40◦C and water temperature below zero, there would have to be something pretty compelling to make anyone venture in but it seems, from various accounts that I have read that people gain real feelings of wellbeing from being immersed in such cold water. This story made me think about the temperature of water and immersion in different temperatures of water more generally. A good long hot bath is something that is often recommended to those with aches and pains, and thermal baths are used, particularly in cold climes such as Russia, to raise the spirits. It seems that immersion in hot water as well as cold water is good for us. Stories of how it’s more comfortable to be warmed up gently if you are boiling a live creature (e.g. lobster or frog) rather than drop it in to be scalded are somewhat horrifying and the now infamous ‘boiling a frog’ suggestion has been contested by a number of conservation bodies (e.g. see Kruszelnicki, 2011). However as a metaphor for how humans simply do not see change that is all around them, it is I think still useful. Polar bears have an extraordinary capacity to withstand very cold water. 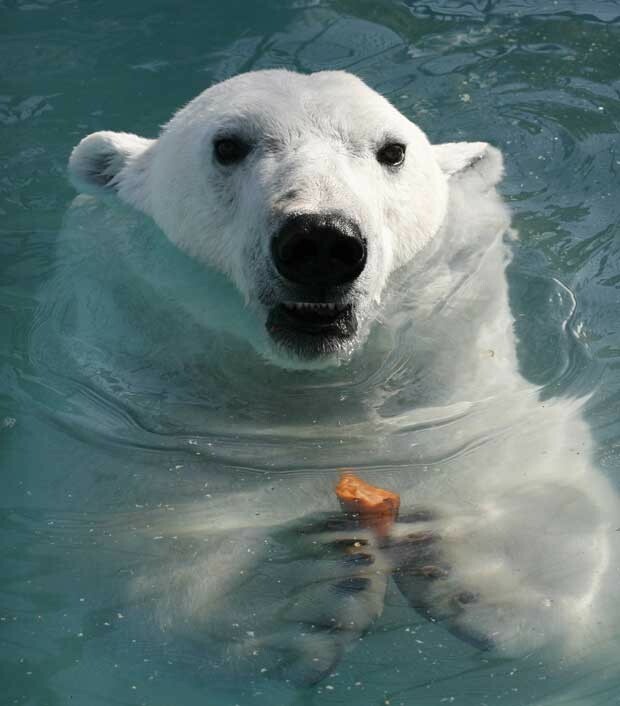 In a study in 2008, an adult female polar bear with a radio collar ‘made a continuous swim of 687 km over 9 days and then intermittently swam and walked on the sea ice surface an additional 1,800 km’ (Durner et al., 2009 p.975). This ability to survive in cold water is mainly as a result of a thick layer of fat, up to 11 cm (4.3 in. ), thick fur and a tough hide. But long-distance swimming in cold water means considerable weight loss and reduces the chances for survival, so it is probably only something to be done in real extremes of need. In humans, the body’s response to the impact of immersion in very cold water has been described as the ‘cold shock response’. It is suggested that the human body ‘can survive in 41-degree F (5-degree C) water for 10, 15 or 20 minutes before the muscles get weak, you lose coordination and strength, which happens because the blood moves away from the extremities and toward the center, or core, of the body’ (Dr Christopher McStay in Ballantyne, 2009) (see www.ussartf.org/cold_water_survival.htm for useful information on cold water survival and how to treat cold water victims). Stories of survival as well as death as a result of immersion in extreme cold water form part of a rich heritage in both film and literature. Perhaps the most famous is the story of the sinking of the Titanic when on April 14 1912 1,514 people died in the freezing sea of the North Atlantic. In 1940 Jack Thayer, a 17-year-old survivor of the Titanic, wrote down his memories of what happened that terrible night (Sherwell, 2012). The story hardly bears reading. The only survivors were those who were out of the water – either in lifeboats or clinging to some wreckage, like Jack.